Two cars meet in a narrow country lane. One will have to back up and give way, but neither Dave (Merton), driving a Volkswagen Beetle, nor Mr Ferris (Geoffrey Whitehead), behind the wheel of a Bentley, are prepared to give any quarter. So a tense battle of nerves begins …. The original version of Impasse was broadcast during the second series of Comedy Playhouse in 1963. Bernard Cribbins and Leslie Phillips were the implacable motorists, whilst Yootha Joyce and Georgina Cookson played their long-suffering wives. Here, Tilly Vosburgh is Dave’s wife, Kirsty, whilst Phyllida Law plays Mr Ferris’ spouse. You might expect the script to lean towards the side of Dave, the little man facing off against the rich and privileged Mr Ferris, but that’s not really the case at all. Both are shown to be equally pig-headed and unlikable (it’s plainly no coincidence that they treat their wives in pretty much the same way – badly). Mr Ferris has decided that Dave’s truculence is due to class envy, but maybe Dave just likes a fight. They nearly come to blows a little later, although their fight is more notable for the way each circles around the other, throwing punches in the air. It rather brings to mind a similarly non-contact scrap between Hancock and Sid in the classic radio HHH episode The Last Bus Home. Just as you get the sense that the comic potential has been wrung out of this scenario, then help – in the form of an AA Man (Sam Kelly) turns up – shortly followed by an RAC Representative (Denis Lill). Kelly and Lill are just as good (if not better) than Merton and Whitehead, with the AA Man standing firmly behind his member, Dave, and the RAC Man equally steadfast in defending the interests of his member, Mr Ferris. I’ve said it before, and no doubt I’ll say it again, but it’s a joy to see the quality of the casts in this series. It’s fair to say that Vosburgh and Law have little to do – although they do have a nice scene (not present in the original) where they’re able to pour scorn on their respective husbands. This leaves the field open for the two squabbling male sides to dominate proceedings and it’s amusing that the AA and RAC representatives carry on exactly the same sort of one-upmanship we’d previously seen from Dave and Mr Ferris. The late arrival of a policeman (played by Roger Lloyd-Pack) who finally solves the impasse is another bonus. The sting in the tail – the winner of the battle finds he is forced to back up anyway – brings events to a satisfying conclusion. And unlike the original this benefited from being shot on location, rather than in the studio. But the main thrust of Corn Dolly (the first episode of Survivors not to be written by Terry Nation – Jack Ronder scripted this one) concerns Charles Vaughan (Denis Lill) and his community. This was Lill’s sole appearance during the first series – it seems that at this time Charles was scripted as a purely a one-off character. 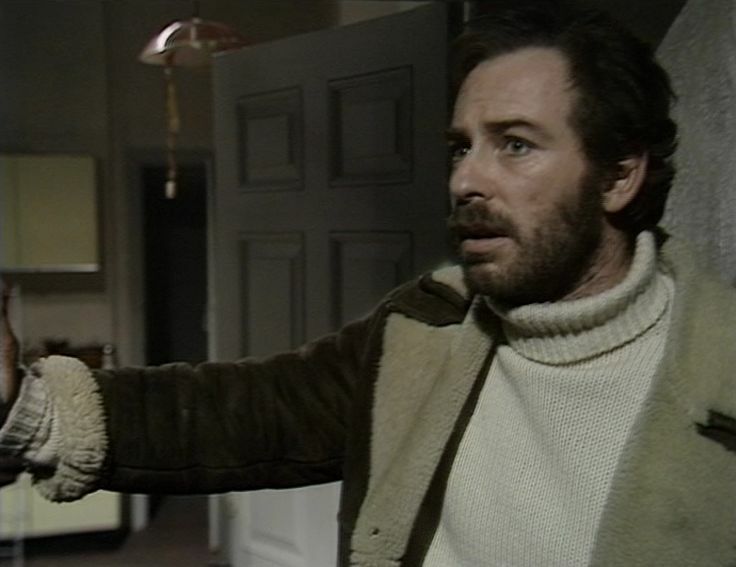 However, Carolyn Seymour’s departure after series one meant that Charles Vaughan would return as a regular and by the third series he would become the series’ central character. The decision to bring Charles back didn’t find favour with Ian McCulloch (although he stated later that he didn’t have anything against Lill personally). McCulloch considered that another male lead diluted Greg’s role (and he also argued that it had an adverse effect on Jenny’s character development). But although the character of Charles didn’t appeal to McCulloch, the series was immeasurably strengthened Lill’s presence. Even in this episode (when it becomes clear that Charles has opinions which Abby, Greg and Jenny find unpalatable), he’s still an appealing character, since he’s practical, organised and friendly. Before the death, Charles was someone who was already quite self-sufficient – so what he’s doing now (with a dozen or so people) is simply on a larger scale. But Charles isn’t just content to exist, he wants to know exactly how many people are left. Simply put, are there enough to ensure survival? He estimates that around 10,000 people are still alive in the UK – so if they can survive the next two generations, there may be a chance. There has to be a twist to the story though. Returning to Charles’ community, they find most of the people are dead or dying – poisoned by fish from the river. It’s an indication of just how fragile life is now: even a handful of deaths means that the ultimate survival of the human race could be placed in jeopardy. Charles has his own opinions on this (and it’s not one that Abby can agree with). They need children (as many as can be produced) and in his eyes monogamy is no longer an option. Any women of child-bearing age need to be in a constant state of pregnancy (and the identity of the father isn’t that important). This is a debate that has been heard before in post-apocalyptic fiction (we see a similar community in The Day of the Triffids). Abby finds the notion of women becoming little more than cattle unpalatable and it’s Charles’ insistence on this point that forces Abby, Greg and Jenny to leave (it becomes apparent that all the women are either pregnant by Charles or, had they not died, would have been). Of course, when Charles returns as a regular character his more extreme views are downplayed or ignored (in series two he has a partner, Pet, and this appears to be his only relationship). It’s the shades of grey that make Corn Dolly such an intriguing episode. Charles does burn with the conviction of a zealot, but it’s possible to understand his point of view. However, in a world where medical assistance is so limited, childbirth becomes very hazardous. But without the next generation, there is no future.